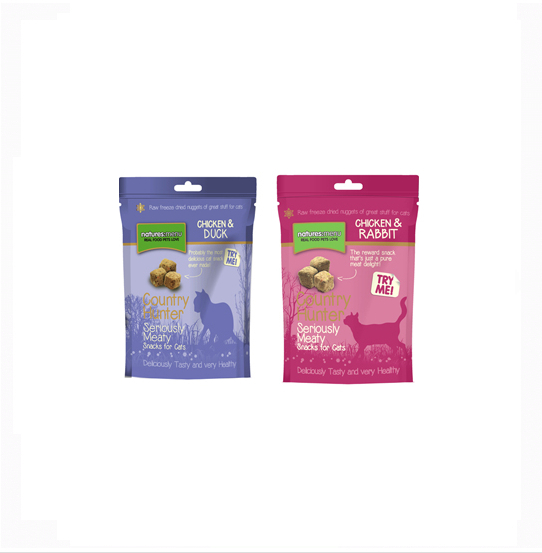 Natures Menu Country Hunter Seriously Meaty Freeze Dried cat treats are filled with tasty ingredients which cat love. By freeze drying them it locks in the flavour and nutritional goodness. Each recipe is grain-free and contains no artificial colours, flavours or preservatives. Ideal for just treating your cat or for crumbling over food to release all the fantastic flavours within. Chicken (55%) inc. 5% Liver, Duck (40%), Malt Extracts (1%), Yeast Extracts (1%), Cranberry (1%), Yucca Extract, Green Tea Extract, Grape Seed Extract, Yeast Extract, Dicalcium Phosphate, Calcium Carbonate. Vitamins: Vitamin A 2,000iu, Vitamin D 200iu, Vitamin E 28mg. Trace elements: Zinc sulphate monohydrate 102mg; Ferrous sulphate monohydrate 40mg; Cupric sulphate pentahydrate 14mg, Calcium iodate anhydrous 0.85mg; Selenised yeast inactivated 17.4mg/kg. There are currently no questions for Natures Menu Country Hunter Seriously Meaty Freeze Dried Cat Treats - be the first to ask one!